Kashmir University Recruitment 2018 – 19. 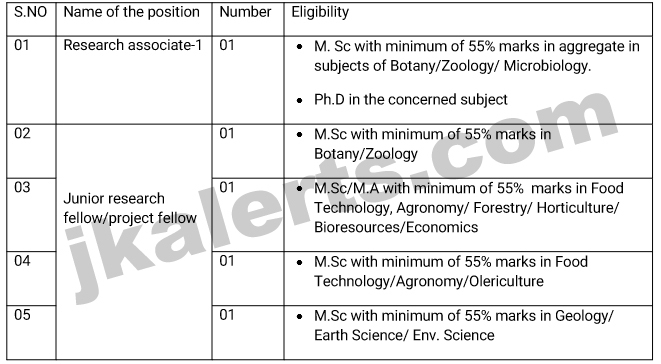 KU recently published the official jobs notification for the posts of Research Associate, JRF and Project fellow jobs. Kashmir University Recruitment 2018 – 19. Free Job Alerts and Updates for both Fresher and Experienced Candidates. Get Direct Official Link from kashmiruniversity.net for applying Kashmir University KU Recruitment along with current Kashmir University Recruitment official Notification 2018 -19 here on jkalerts.com. Check all latest Kashmir University 2018 -19 job openings instantly here on jkalerts, Know upcoming Kashmir University Recruitment 2018 immediately here. Find all recent Kashmir University Vacancies 2018. The interested and eligible candidates are invited for a Kashmir University walk-in-interview to be held on 09 August, 2018 at 10.30 AM in the office of Dean Research, University of Kashmir, and Srinagar for filling up the following positions available in the National Mission on Himalayan Studies Fellowships program. Jkalerts will provide you the complete detail about this J&K Govt job notification like Eligibility criteria, How to apply Online, Important dates, Age limit with relaxation, post by category, Selection process & official notification. So interested candidates are requested to read it carefully to apply University of Kashmir jobs. The positions are purely temporary and co-terminus with the tenure of the project. The candidates should bring original certificates/ transcripts and other documents indicating qualification, percentage of marks in the qualifying examination, age, certificate of having qualified NET and/or similar accredited tests and research experience in the relevant field (if any) on the day.